New Dawn: The Battles for Fallujah (2010), by Mr. Richard Lowry, (http://richardslowry.com/) painstakingly details the 2004 battles that ravaged Fallujah, Iraq. Fallujah was, before 2003, a city of some 425,000 inhabitants, physically located on the Euphrates River in Anbar Province about 30 miles west of Baghdad. The city is small, roughly nine square miles, approximately the physical size of Santa Fe, New Mexico, or Provo, Utah. American readers will know it, if at all, as the fierce center of jihadist opposition to the United States’ war on the government of Saddam Hussein in the dangerous western desert of Iraq. Fallujah stuck its finger in the public eye when in March 2004 a murky throng of Al Qaeda in Iraq kidnapped, murdered, and burned several employees of Blackwater Corporation, then hung their bodies from a bridge and broadcast the images to the world. In ten days, the Marines exacted punishing revenge on Fallujah, sending tanks, aircraft and, of course, men on foot to attack, find, and kill the insurgents. However, by the end of April, the Marines had lost 114 men, including eighteen dead, fighting in a city in which the enemy was indistinguishable from civilians, ambulances were troop transports, and mosques and hospitals were arsenals. The some 700 enemy who died, and untold thousands injured, were portrayed to the world, certainly the Islamic and Arab worlds, as largely civilian casualties in a battle run amok by Americans. Acknowledging that the response had been more for revenge than tactics, and ill-timed, President Bush ordered a retreat. Fallujah was returned to the care of an illusory Iraqi force to pacify their own city. Within a few months that force had disappeared and Fallujah again became the most dangerous city in the Middle East. Mr. Lowry is a writer of great talent in a difficult genre, the chronicle of non-fiction current military history. Mr. Lowry’s hallmark is meticulous research from first-level resources and interviews. His earlier work, The Gulf War Chronicles, (2003), parses the myriad of conflicting reports and engagements of Operation Iraqi Freedom to provide a single reliable and well-written volume of the history of Iraq’s invasion of Kuwait and the crushing war that followed. Marines in the Garden of Eden, (2006) won the Military Writers’ Society of America Silver Medal for its intimate narrative of the 2003 battle for Al Nasariyah. The writing of military history is difficult for many reasons, not the least of which is the demand for artful talent necessary to avoid a monotone of unit numbers, positions, individual names, and military acronyms that can and usually do defeat the reader more completely than the subject units defeated their enemies. Mr. Lowry has done a very good job of managing such information in all his work and New Dawn is no exception. However, the writing of current military history is especially challenging because it presents the author with a challenge that traditional historians do not face – information. There often is either not enough source material from first- level documents or the sources are incomprehensible. To that there must be added the duty to account for the wash of second-level information, such as news reports, individual interviews, and the like, without losing valuable material or relying on sources that for many reasons are not credible. Finally, one must then actually write the history. The withdrawal from Fallujah in April 2004 was, in retrospect, probably the worst thing that the occupants could have hoped for. They had held on to the city for two reasons – the Marines had reacted with too much haste to prepare for a decisive attack on a city of such size in which a huge, albeit unknown, portion of the residents were civilians and, second, the insurgents had managed the information threshold in such a way that the death of several hundred ostensible proper citizens was perceived in the Arab world as vastly worse than the mutilation and parading of four American contractors by a few overachieving zealots. The military and political commanders of 2004 took their time to plan for and cure those two errors. When the real battle for Fallujah resumed in November 2004, the city had been emptied of non-combatants and the American penetration of the city would be accompanied by news crews that would beam to the world mosques filled with rocket propelled grenades, minarets with machine gun and sniper posts on the highest points, and schools and hospitals that were fully stocked arms, munitions, and grenade stores large enough to equal any depot in the middle East. The world would not see another false portrayal of one-sided American bullying. New Dawn details the organization of the units that were assigned and, in some cases, created, to form the force that would attack Fallajuh. Mr. Lowry provides modest portraits of the commanders, Major General Natonski, Lieutenant Colonels Malay and Buhl, and many others from the Corps level to squad levels. He integrates the men with their units with brief histories of their heritages and honors, then sets about to place them in and around Fallujah. It is in the book’s exacting details, however, that Mr. Lowry’s research shines. He moves effortlessly back and forth from a description of a plan to what actually happened. For example, one component of the initial attack was to blow railroad rails with mine clearing line charges, a plan that worked everywhere except in the one place it should have worked – one regimental combat team’s engineers simply couldn’t breach the tracks, not with clearing charges, not with D-9 Caterpillars, until that portion of the attack was hours behind the troops that they were to support. The taking of Fallujah was a combined assault plan. The city was encircled and covered by multiple layers from the air. The western edge of the city, adjacent to the infamous bridges, was taken by a water-supported invasion up and across the Euphrates. However, the devil of the mission was whether to penetrate in force to achieve targets, to move house to house, or to bomb. At some risk, the decision was made to do all three. Mr. Lowry details the painful attacks from north to south down Fallujah’s walled streets to take the al Tafiq mosque, the Hydra mosque, the Cultural Center, Jolan Park, Objective Ohio, the Blackwater Bridge. Fallujah was a city with no open spaces and few streets wide enough for a tracked vehicle. Control and consolidation demanded that the force penetrate with some speed to the main east-west thoroughfare, a highway known as Michigan, and to take control of the Government Center on its northern side. Doing so meant that the attacking troops would have to bypass literally thousands of houses and structures to press the attack, knowing that they would have to go back and clear those houses one by one. …There’s no getting out of the conclusion that we have made an immense failure here. The system must have been far more at fault than anything that I or anyone else suspected. It will have to be fundamentally changed and what that may mean exactly I don’t know. No one knows exactly what they do want, least of all themselves, except that they don’t want us. (Excerpt from The Queen of the Quagmire, Rory Stewart, New York Review of Books, October 25, 2007). Thus, rather than undertake to explain the inexplicable, or at least the incoherent, history of that part of Iraq, Mr. Lowry undertakes to describe the brutal repetition of that history that happened in 2004. Mr. Lowry writes that the defenders were not only Iraqis, albeit Ba’athists and Saddamists, but also Al Qaeda in Iraq, Arabs, Syrians, and other outsiders, all of whom found a place in a city and province historically unwelcoming to outsiders. He almost certainly did not have access to records or interviews by those who defended Fallujah or supplied the defenders with an astonishing array of both weapons and training; the population of the city two years after the November 2004 battle was less than 200,000 people, and the book makes quite clear that those who stayed and fought in 2004 died in droves, particularly in the final phase. His book, then, is written in no small part because the order to clear Fallujah inevitably meant that a command to go back and clear the houses in the city after the large objectives had been achieved would also be a call to honor. Of the ninety-three Americans who died and the vast, unstated number who were severely wounded, the largest number of casualties took place during the post-objective house-to-house and face-to-face clearing confrontations. The willingness of the jihadists to stand and fight at the portal of death is inexplicable. The willingness of young American soldiers to go up the stairs, around the corners, into the basements, on to the balconies, and behind the walls, not only to capture or kill their enemies but to recover their own, is beyond description. Mr. Lowry’s history is written, perhaps inevitably, with a clear devotion to the Marine Corps and especially to the individual units who fought the New Dawn battle for Fallujah. He acknowledges that units from every other branch, the Army, the Navy, even the Air Force, contributed, but this is a Marine study. It certainly is a book that every Marine should read. It also is a work that should be read by all who want to read a close-at-hand study of a modern combat engagement in urban quarters. It is a valuable resource for students of the details of urban insurgent combat tactics and weaponry. And finally, it is a book about the call to honor of doing uncertain and deadly work for no reason other than accepting the role of being an American in an uncertain world. 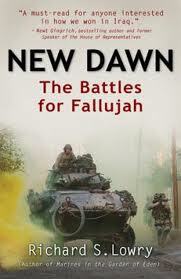 New Dawn: The Battles for Fallujah (2010) Savas Beatie Publishers, www.savasbeatie.com, $29.95.